What's Really Going On In Greece: Sweet and Sour Cucumber Salad. We threw a little party at the weekend for our birthday. Mum manned the battle station - the kitchen - we (my Dad, Brother, Husband and I) were given our marching orders at various points in the day. When all was done and the battle was won mum had roasted 5 chickens, made healthy potatoes wedges, invented a desert, and created at least 7 side dishes and a vast number of salads. She had as always, created a feast of glorious colours, flavours and aromas. Just at the very sight of all the food my taste buds went into an imaginary over drive and like my two huge lumps for dogs that had gone crazy at the sight and smell of so many chickens in the oven, I was drooling. 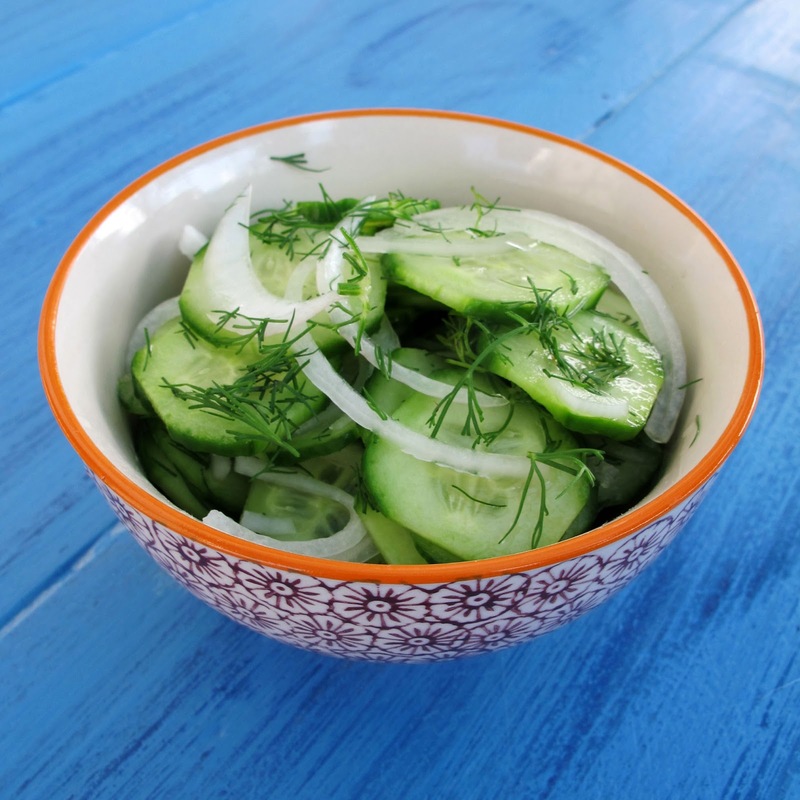 One of her creations was a cucumber Salad, which was a pleasant surprise on the pallet, sweet yet sour. I thought that I might share it with you all. The great thing about this is that you probably have almost all the ingredients in your house already. Check All Add the Missing to Shopping List! 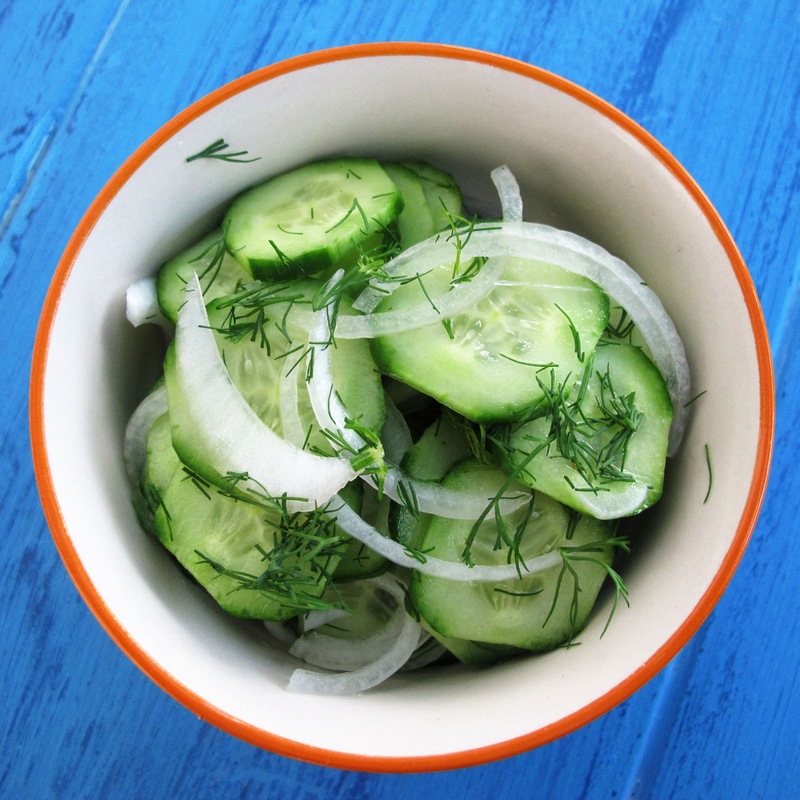 Thinly slice the onions and cucumber then toss them together in a large bowl. Combine the vinegar, water and sugar in a saucepan over medium-high heat. Bring to a boil, and pour over the cucumber and onions. Stir in dill, cover, and refrigerate until cold. This can also be eaten at room temperature, but be sure to allow the cucumbers to marinate for at least 1 hour.